Every year, I look forward to the end of the year student sale at Gage Academy Of Art. Not only is it fun to show my husband the works of art that result from my job as an art model (which are always out of our budget), but I love the prospect of finding an exciting piece at a really great price. Investing in the artist’s of the future is a beautiful experience. I wonder if my husband and I will end up like Herb and Dorothy Vogel – on a beer budget while living in a place where art rules the house. This year, I fell in love with Helen Bouchard’s value study of John The Baptist, by Caravaggio. The young boy looks decadent and satiated, nuzzled by a lamb that he embraces. In Helen’s simplified version the mastery of the composition truly comes to life. I can’t stop looking at the left foreshortened leg, and the way the pose circles around on itself. at the museum, how Georges de la Tour was influenced by Caravaggio’s contrasting darks and lights. 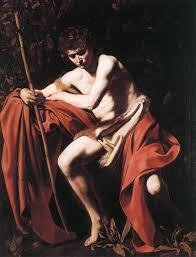 I read how Caravaggio was possibly influenced by the religious theatricals of his youth. Through his love for life study, he brought a realness to the characters that he depicted, which was previously unheard of. Sunburned skin, a deformity of a finger, an angel that actually touches St. Matthew. His scenes are caught in the middle of an action, not before or after, which was an influence on filmmakers like Martin Scorsese who captured real people of the streets in action with grit and humanity. I decided to take a class this month called Copying the Masters: Caravaggio. On our first day, we were asked to choose a color copy of a Caravaggio painting to work from for the entirety of the class. I had gone in hoping to paint a Bacchus, but instead I was drawn to a brooding shepherd boy with the shadow of dark thoughts. When I got home, I realized I had picked a later version of John the Baptist. It seemed meant to be. John the Baptist was a messenger. I view myself as a messenger – though my messages are of an entirely opposite nature. We prepped our canvases with a burnt sienna gesso (I had also pre-prepped with two coats of oil grounds which gives the canvas a smooth and slick base). We drew the basics with chalk, and then began with an under-painting of burnt sienna thinned with linseed oil, as we built up the lights and darks. In the style of the masters, an oil painting begins with Burnt Sienna and Cremintz White, where the shading is developed. From there, the painting goes into grayscale. And then finally, the intense colors are glazed over the top. This is an extremely structured way of working, and I struggled not to rebel. I love color, and I impatiently added too much too soon. Oils are naturally translucent, so the style of the masters can almost seem like watercolor in the final stages. Cremintz White is hard to find. The only line of paint I found that still carries this lead-based white is Winsor & Newton. It goes on silvery and thin, and is built up over many layers. 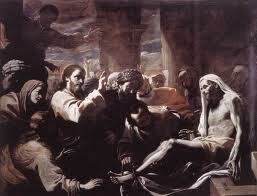 Our teacher, Michael Lane, told us when they exhumed Caravaggio’s body, they found a high level of lead in his remains. Michael relayed how the 19th Century Russian artist, Fechin, thought nothing of licking his palette knife as he worked (for the perfect mixture of water and oil in saliva), double dipping as he spread paint across the canvas. Fechin spent a fair amount of time in the hospital for this toxic habit, but probably never gave it up. Michael has a few toxic habits of his own, never wearing gloves, and using his finger to push paint around the canvas – refreshingly old school. As for me, I wear vinyl gloves when I work. I am learning a lot as I try not to struggle against the structure of the old masters. Generally, I am an independent learner. I’ve absorbed an enormous amount just from being a model, voyeuristically taking it all in as I watch from afar. Usually, I get paid to be there, so it’s hard to swallow how much I’ve spent to be a student. Interesting to be on the other end. Three hours go by so quickly, in comparison to when I’m working. This summer, painting has become my escape from the pressures of having my writing published and “out there” in the public eye. I’ve learned that whatever happens with released work, it has no real bearing on my actual life, and what really matters is my own daily personal craft. Painting has reminded me of that. It’s brought me back to the happy place. In front of a canvas, time disappears. Six hours seems like one. My brain goes into full focus. I get lost in line, form, and color while playing Beethoven. I don’t have to do it, but I love to do it. It soothes me. Writing is something I have to do. It’s who I am. I never grow tired of it. Ideas push to the surface and flounder until they find expression. I have a message to share that I’m compelled to spread, like John the Baptist who may or may not have existed. He’s a legend. Eating locusts and wild honey, wearing camel fur, subsisting in the dessert. He seems to be my archetype this summer. A summer where I’m coming to terms with the Bible as literature rather than as the facts I was taught as a child. Strangely enough, today I rescued a locust-like insect from the elevator, and who knows why, I released it onto my balcony (where it disappeared before eating the garden). For a while, I watched it scratch itself with it back legs, and clean its front feet. Tiny little eyeballs, and off kilter antennae. Perfect yellow green – Terre Verte mixed with Indian Yellow. To understand Caravaggio more, I picked up Caravaggio – A Life Sacred And Profane. The book was less about his life, and more about his paintings and the time in which he lived. He lived from 1571 – 1610, around the time of Shakespeare. He spent much of his life on the run for violent crimes, and found success through patrons in the church. He expressed his sensuality through Biblical themes. His models were courtesans, workshop assistants, and painter friends, all posing as the elevated figures worshipped in the Catholic church. I like the irony of his models. Sensuous boys and prostitutes, bawdy people of the streets – some who eventually found fame in their trade. scandalous, that his sunburned Bacchus disappeared in the collection of the Medici (so much was the embarrassment of a peasant in a painting) resurfacing 400 years later in the basement of the Uffizi. Every other painter of Caravaggio’s era has faded over time. He was an embarrassment in his lifetime. But artists ever since have been influenced by his style. A style that came from within, and certainly wasn’t taught by his limp teachers. He sent the message of what painting could be, and no one could turn back after what they saw. Now that the air is growing cooler, I am ready to be fully immersed in my writing again. But my journey with Caravaggio has brought me back to painting for good. The two seem to be in perfect balance. Writing searches the brain for problems and answers, while painting releases the brain, disappearing into meditation. You are currently reading Copying Caravaggio at Lauren J. Barnhart.